Wow! I can’t believe it has been 22 months since the last release to Blasteroids! In August of 2015 I began the process of upgrading the project to Unity 5, with the intention of overhauling the UI and getting Blasteroids listed on the Windows Store. I was also considering a way of monetizing the game, by adding some additional features that could be unlocked with a single, permanent IAP (in-app purchase), or temporarily by watching a short video ad on some platforms, such as Android. However, after only a couple of months of work on this big upgrade, I set it aside so I could focus my efforts on Cubiq. But then in January of this year, I learned of a contest being put on by Unity and Microsoft, that required submitting a game to the Windows Store. So, due to the time limit of the contest, and in the hopes of winning one of the prizes (such as a Unity Pro license), I re-focused my efforts on Blasteroids again to get it on the Windows Store in time for the contest deadline. Unfortunately for me, I didn’t win anything in the contest, as there were many other much better submissions than my own. So I put Blasteroids on hold again to focus on Cubiq once again. 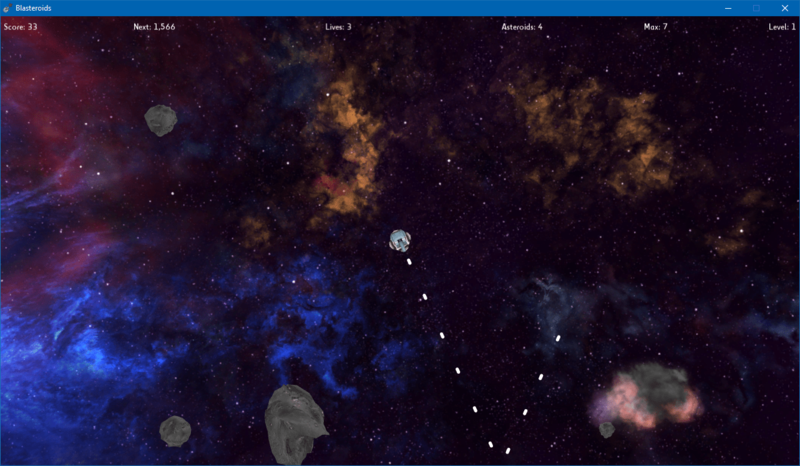 But now that development is finishing up on Cubiq’s beta, I’ve had some more free time to focus on Blasteroids again. All that to say, it’s been over one year in the making (working off and on) and almost two years since the last update, but now the latest Blasteroids update is here! Let’s face it, the old UI was pretty terrible. But now it is much more visible and better looking. Here are some before and after screenshots of the UI. I added some new “cheat codes” in the options menu to give some variety to how the game plays. Note that while any of these are active, you won’t be able to attain a high score for the leaderboard. Also keep in mind that the cheat codes allow the game to do things it was never really intended to do, such has have hundreds or even thousands of bullets on the screen at once. This can cause performance issues. So have fun, but use these cheats at your own risk. This changes the default behavior from “world wrap” to “bounce.” In other words, when asteroids or bullets reach the edge of the screen, they will bounce off the edge instead of warping to the other side. This makes it so bullets don’t disappear until they destroy an asteroid. You can have a lot of bullets on the screen at the same time with this one! This one does exactly what it says on the tin. It allows you to shoot very quickly. 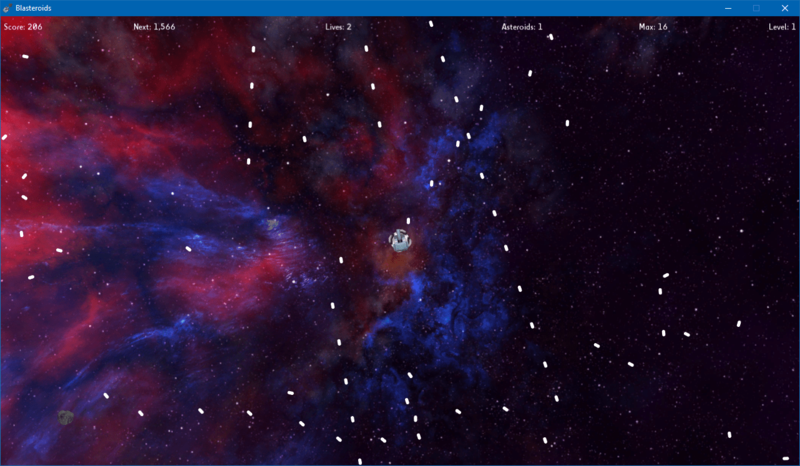 This mode is to help alleviate the boredom of only having a few asteroids on the screen. 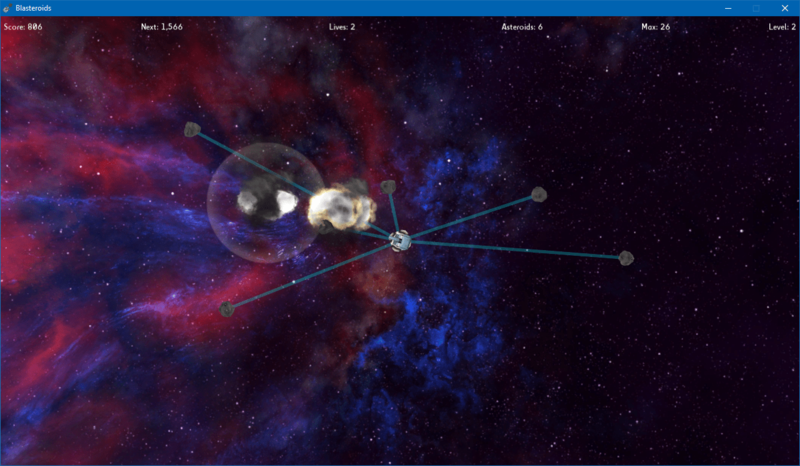 When there are 10 or less asteroids on screen, the tractor beam will pull them toward you. If you remember the beginning of this post I said that I was considering monetizing the game by requiring some sort of purchase or viewing of an ad to enable these features. Well, you may be happy to know that I’ve decided against that. These features are free and available right now. That said, if you would like to compensate me for the time and effort put into this game, donations are very much welcome. The full changelog since the last update is below. [Android] Fixed game locking up when connecting to Google Play Games Services. 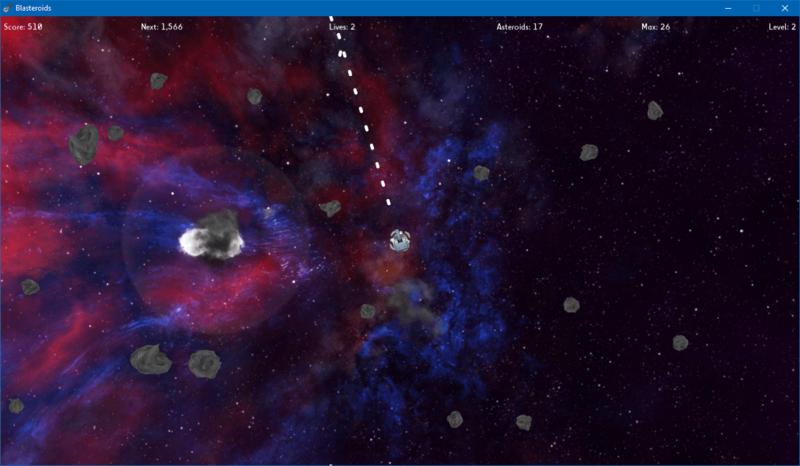 Asteroids now spawn in random positions instead of in predefined positions. Game now accepts gamepad input for aiming/shooting. Improved worldwrap to work correctly at lower framerates. Preload some objects at beginning of game to improve spawn rate. Cache some references instead of looking them up repeatedly. Don’t count as two deaths if quitting while already dead. Fixed World Wrap not updating after screen resize. Tweetbot sends Tweets when achievements are unlocked. Minor tweaks to various Tweets.